Single cask bottling from a lovely distillery which symbolized nice character of Northern Speyside. Smells like ester floral honey, ringing barley sweetness in the mouth, and bright sounds.. These are main features of Glenlossie. Plus, As for this bottle, I guess you could find some aromatic flavors like grapefruit peel, derived from beer hops, for instance. 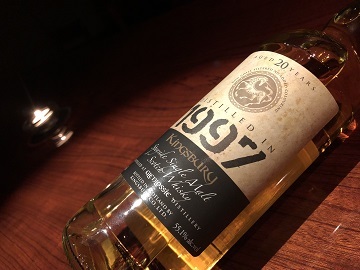 With 20years maturation, It had gotten a certain richness for a hogshead, but still delicate, and hasn’t lost their charming figure. It makes me feel like sitting on a stump by the rural brook that is reflecting the sunlight early in May. Bottled by Japanese IB Kingsbury, I’m sure they are also one of the finest independent bottler who’ve kept giving us lots of memorable items.